The Bluebonnets are in full bloom - a storm is on the horizon - the old pick-up and the small plane above wend their way home. This beautiful print certainly makes you want to drive down that road too and drive into that wonderful scene. Sometimes the image and colors in a painting can have an immediate impact on us — we were blown away with Phillips' masterful use of every possible shade of blue in this scene from the Texas hill country. A solitary rancher in his old Ford pickup drives toward his home beneath the live oaks. 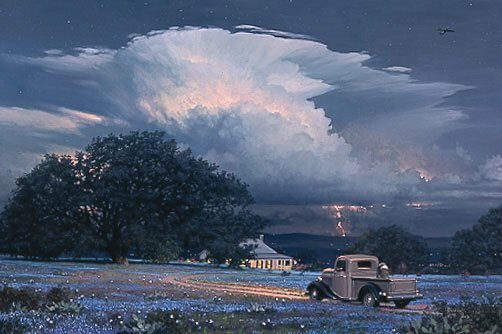 In the sky flies a DC-3, heading away from a thunderstorm that is rumbling across the plains, the lightning adding white light to blue moon glow on a carpet of Texas Blue Bonnets.